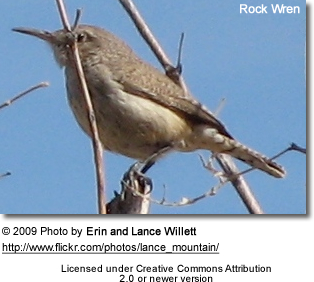 The Rock Wren (Salpinctes obsoletus) is a small songbird of Wren family. It is the only species in the genus Salpinctes. The 12 cm (4.75 inches) long adults have grey-brown upperparts with small black and white spots and pale grey underparts with a light brown rump. They have a light grey line over the eye, a long thin bill, a long barred tail and dark legs. 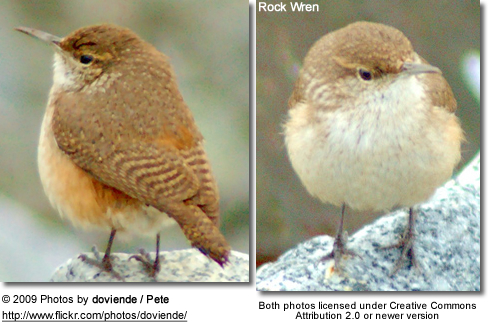 Similar species: Canyon Wren is similar to the Rock Wren but has a white throat and upper breast contrasting with its darker underparts and a longer bill. 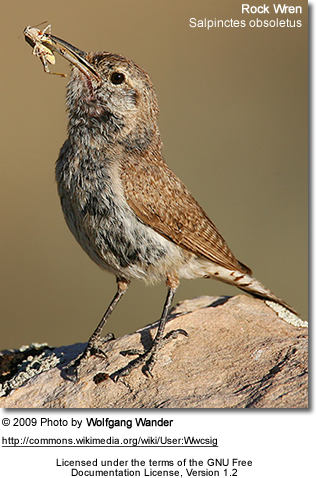 Bewick's Wren has a bolder supercilium (line above eye) and lacks contrast between the back and rump. Their breeding habitat is dry rocky locations, including canyons, from southwestern Canada south to Costa Rica. These birds are permanent residents in the south of their range, but northern populations migrate to warmer areas from the central United States southwards. They occasionally wander into the eastern United States. 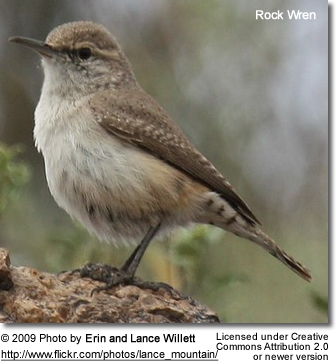 This bird builds a cup nest in a crevice or cavity, usually among rocks. These birds forage on the ground, probing with their bill. They mainly eat insects and spiders. Copyright: Wikipedia. This article is licensed under the GNU Free Documentation License. It uses material from Wikipedia.org and USGS.